The BJP was on Saturday on course for a landslide victory in Uttar Pradesh and Uttarakhand and the party was locked in a close contest with Congress in Goa and Manipur. 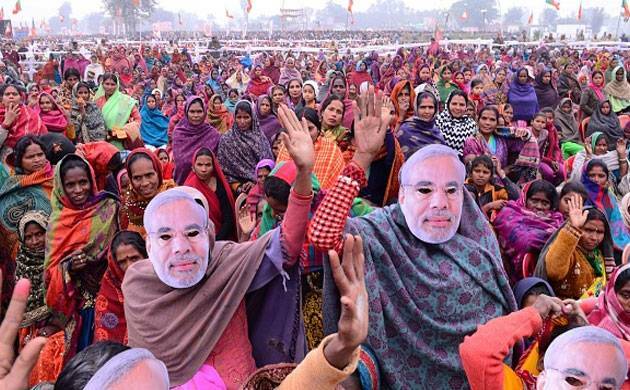 According to trends and results available after six hours of counting of votes in the Assembly polls in the five states, the BJP, which did not have a chief ministerial face in UP, was ahead in 300 out of 403 constituencies in a stunning showing which party leaders credited to a 'Modi wave'. As the opposition meltdown continues and Prime Minister Narendra Modi keeps driving more electoral success for BJP across the country, the experts and even the strong opposition leaders have silently agreed that indeed Modi wave exists and continues to strive. National Conference's Omar Abdullah tweeted on Saturday: "How the hell did almost all the experts/analysts miss this wave in UP? It's a tsunami not a ripple in a small pond." In a series of tweets Abdullah expressed his opinion and suggestions for the opposition parties in India. In a nutshell there is no leader today with a pan India acceptability who can take on Modi & the BJP in 2019. At this rate we might as well forget 2019 & start planning/hoping for 2024. I've said this before & I'll say it again the voter needs to be given an alternative agenda that is based on what we will do better. Criticising the PM will only take us so far. The voter needs to know there is an option available to them that has a clear +ve road map. How the hell did almost all the experts/analysts miss this wave in UP? It's a tsunami not a ripple in a small pond. Positives for BJP - obviously UP & Uttarakhand & the overwhelming mandate. Implications for Rajya Sabha & President V/President elections. The phenomenon of Modi wave originated during the Lok Sabha elections of 2014 and it was meant for just that and as soon as elections were over, the critics started challenging whether the Modi-wave will continue to give mileage to the BJP. But, except Delhi and Bihar, the BJP kept on winning elections after elections across the country right from civic body polls to the magical victory in Uttar Pradesh. Critics say that Modi has been a polarising figure and he believes in divisive politics. But the thing Modi does well is that he keeps his focus on his voters and followers only with talks about development and corruption. He doesn’t do anything that disappoints his fan base. He would rather play silent and even encourage his haters to bark more. And by this strategy his gains both ways. In his speechs, he talks about himself and his government, and his opponents also talk about him and his government to criticise him. And this may the biggest reason why the opposition leaders fail to get support during elections. The Opposition needs to understand that Modi doesn’t lose heart with hate speeches against him as he just loves to retaliate with phrase like 'jitna kichhad uchhaloge, kamal utna hi kamal khilega' (“the more you throw mud, more the lotus will grow”). There is a list of leaders who have launched personal attacks on Modi, and by doing that they played the most significant role in the making of the Modi-wave, which is just refusing to fade even since he has spent almost three years in the central government. One important thing which goes in Modi's favour is that he always talk about corruption-free India and development, and there is not a single charge of corruption against him till now. His opponents come together to just one thing – ‘blame Modi’ and deny that any Modi wave exists. From Akhilesh to Rahul Gandhi and from Sonia Gandhi to Mulayam Singh, all of them accuse Modi for being communal, but the voters have stopped believing in them it seems. One big thing which people like about Modi is he focuses more on giving a bigger picture to people – the need for development and economic growth. Modi's opponents do blame him saying he believes in marketing strategy only. There's nothing wrong if his marketing has shown excellence. Marketing strategy works only when it doesn't get support from the leader's excellence. “Aab ki baar Modi sarkar“ and “Achhe din” phrases were two biggest examples of marketing which clicked for Modi in 2014 Lok Sabha elections. That marketing wouldn’t have worked if Modi was not loved by people. The faith people of India have, however, gets reciprocated by Modi's words and action in government – which is why there is a Modi TsuNaMo.